Manto’s as rightly conceived by Ajoka Theatre, was a Gustaakh fiction writer, who never lived to win a popularity contest. Many of his afsaanas raised hullabaloo and he was prosecuted by court, along with other writers of the same league like Ismat Chughtai. Manto’s response remained that he inks what he sees around him. He never tried to cover up the evils he saw under any non-existing cloaks of morality and civilization. 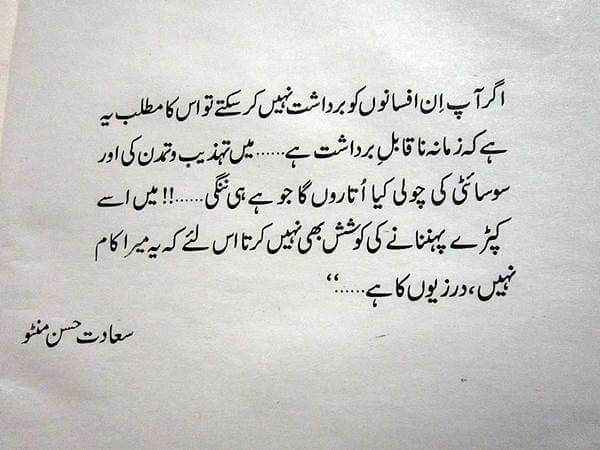 Below is a short response by Manto to his critics, which remains humorous and poignant at the same time. Allama Iqbal’s poems on Eviction of Adam from Heavens as Earth welcomes him. Rumi’s Shrine [Mevlana Museum] in Konya, Turkey.